Yesterday we celebrated my friends birthday with a big night out. Come morning and by morning I mean afternoon, we were in need of a good feed. Brunch was in order. We decided to go to Mr. Brightside. They had everything you could want for brunch and more. It was a really cute venue, they had bits and pieces around like picnic baskets, hanging plants, cages around the lights and pretty ceramic plates, which gave the place character and made it feel cosy. Mr. Brightside – Morning coffee. First stop, coffee. Well actually I ordered a fruit juice blend because I was in need of some nutrients and it went down a treat. It was freshly squeezed and delicious. I think I skulled the whole glass in one sip. Yum! 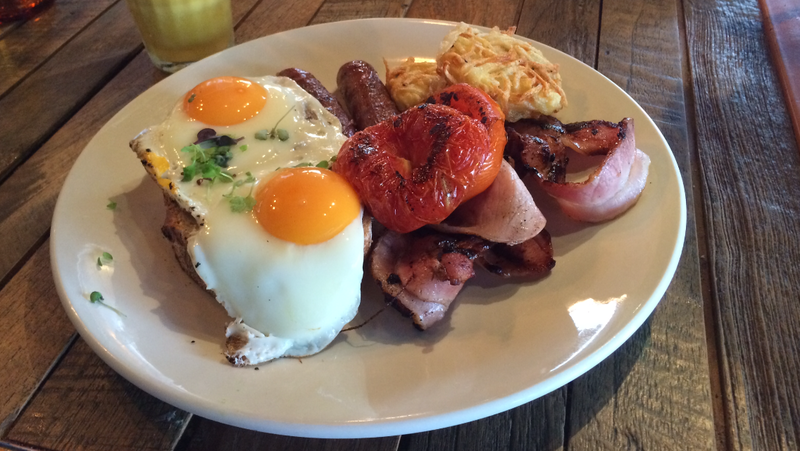 Mr. Brightside – Brightside Big Breakfast – fried eggs, bacon, tomatoes, sausages and hash browns. This was one of those instances where my eyes were too big for my stomach. I ordered the Brightside Big Breakfast, which had eggs, bacon, sausages, hash browns and tomatoes with two slices of sourdough bread (which I used to soak up the egg yolk yum!). I wanted to tack on mushrooms and spinach and avocado and smoked salmon and baked beans and basically all the sides. But with great restraint I resisted and thank goodness I did because it was already heaps of food. It was absolutely delicious and exactly as I had envisioned. So yum! I have to make a particular mention about the hash browns. They were incredible. They weren’t really oily (like hash browns usually are) and they were so tasty. They were seasoned with rosemary and they were crispy on the outside and mushy in the middle. Amazing! 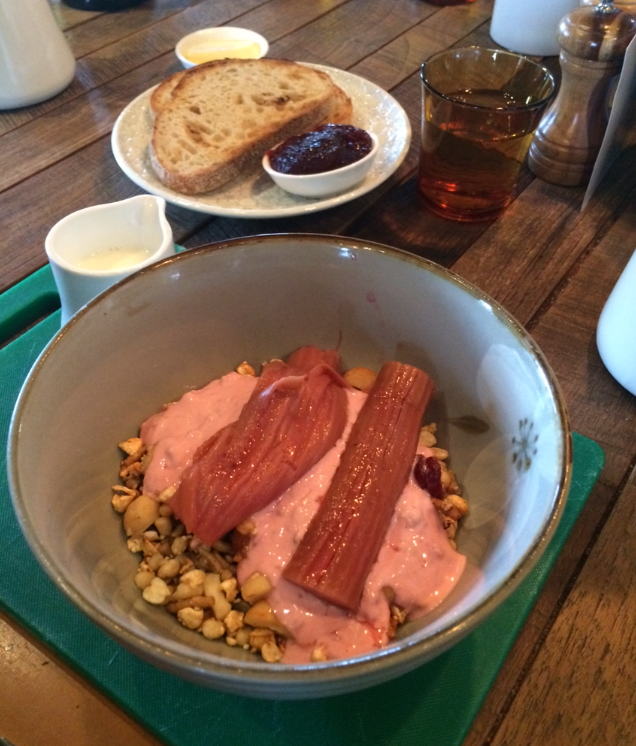 Mr. Brightside – Muesli, yoghurt and rhubarb. A friend ordered muesli and yoghurt w macadamia and rhubarb. The muesli had lots of texture and was packed with macadamias, nice and crunchy. Topped with yoghurt and cooked rhubarb. 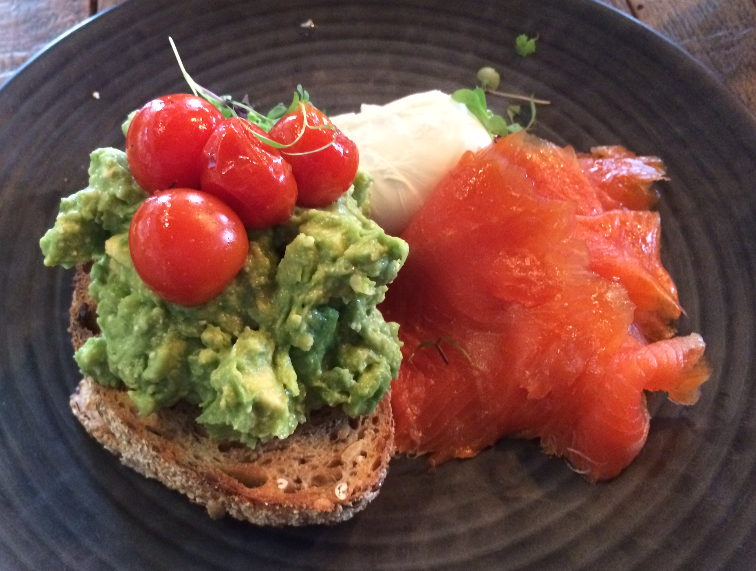 Mr. Brightside – Smashed avocado and feta w cherry tomatoes, a poached egg and salmon. There was the smashed avocado and feta with cherry tomatoes on whole meal toast with shallot dressing. Delish! My friend added extra proteins, a poached egg and some smoked salmon. 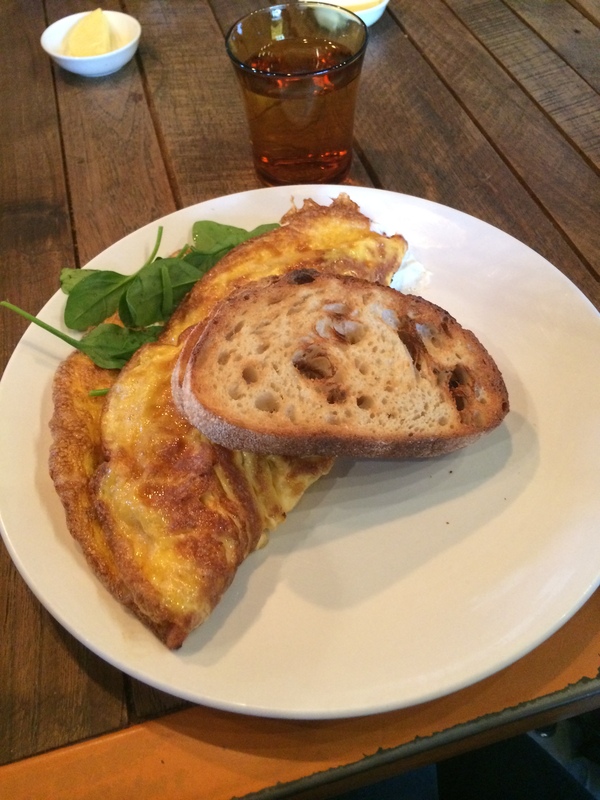 Mr. Brightside – Fluffy Omelette w spinach, mushrooms, tomato and French goats cheese. The omelette was light and fluffy just as an omelette should be. It was filled with mushrooms, tomato, spinach and French goats cheese. It was really tasty. 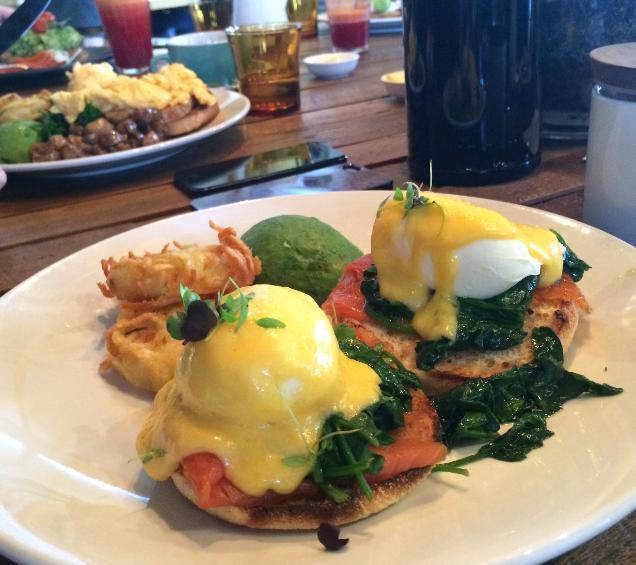 Mr. Brightside – Eggs florentine – poached eggs w spinach, hollandaise & salmon on an english muffin. And the eggs florentine was divine. It was poached eggs with spinach and hollandaise on an English muffin. My friend added salmon, avo and hashbrowns. The add-ons are great they give you flexibility so everyone can alter the dish to suit them. Mr. Brightside – Muffins and slices and scones oh my! They also had a range of sweets to order so you could just pop by for a coffee and cake. They had caramel and vanilla slice, chocolate hedgehog, a range of muffins and scones with jam and cream Yum. I had my eye on the vanilla slice but I was already very full. I decided I would just order it next time since I plan to be back often. Love this place, it was a great place for brunch and they have a variety of menu options that make you want to try everything. We had about ten people brunching and everyone easily found a menu item that matched exactly what they felt like eating. Loved the flexibility in menu and the staff were friendly and accommodating. We were seated inside but if you want to sit outside they have heavy-duty heaters to shield you from the frosty chills of the winter weather. It was a great brunch with a bunch of great friends (try that one on for a tongue twister). Trading Hours: Mon-Fri: 7am-4pm, Sat-Sun: 7.30am-4pm. 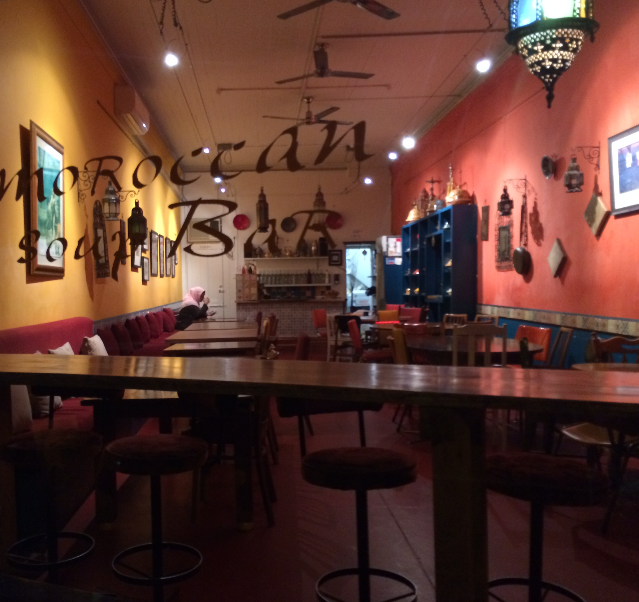 Moroccan Soup Bar – Fitzroy North. 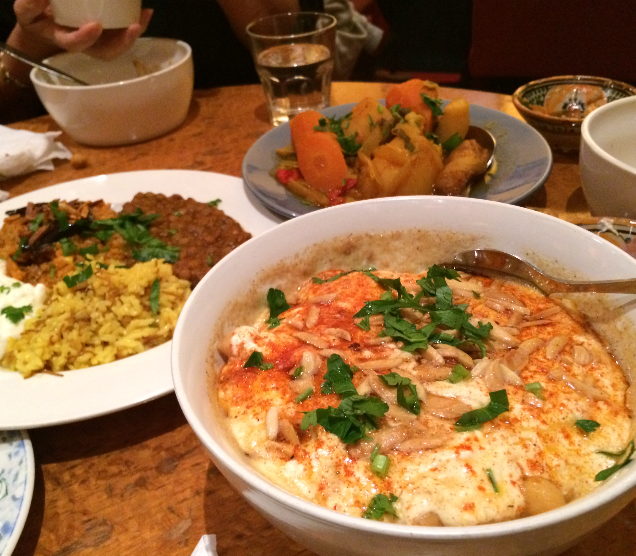 This week we went to Moroccan Soup Bar. My brother was down from Sydney and he’s a vegetarian so a vegetarian restaurant seemed like the perfect place to eat for dinner. The restaurant had really comforting food and a homely atmosphere, which made you feel like you were eating at a friends place. 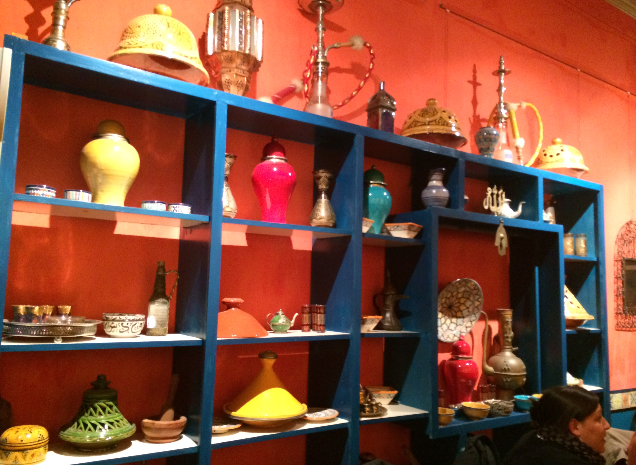 Moroccan Soup Bar – Stuff and things (Tea pots, Hookahs, Tagine cookware). As we sat down we were greeted with a little cup of mint tea. There was no menu. The waitress verbally informed us of the two banquet options available. The $25 banquet included starters, dips, main and dessert and the $20 banquet included dips, main and dessert. 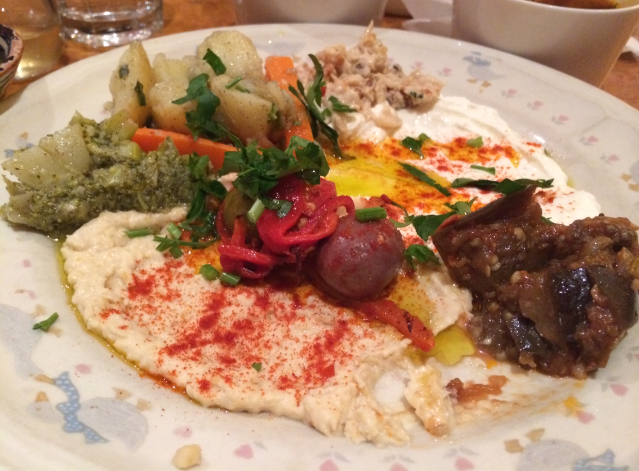 There was a plate of dips, which had yoghurt and humus with roasted eggplant, lemony potatoes, preserved lemon and some big juicy olives served with flatbread. Moroccan Soup Bar – Yummy dips and bits. For the extra $5 you get the starters, which are little bowls of deliciousness. There is a beetroot, feta, walnut dip, roasted spiced pumpkin dip, and a super smokey eggplant dip like a baba ganoush. There was also a haloumi salsa with a sweet syrup, which was different. Some fried potatoes and some fried chickpeas, which were a little bit crunchy and really yum. Definitely worth the extra $5. 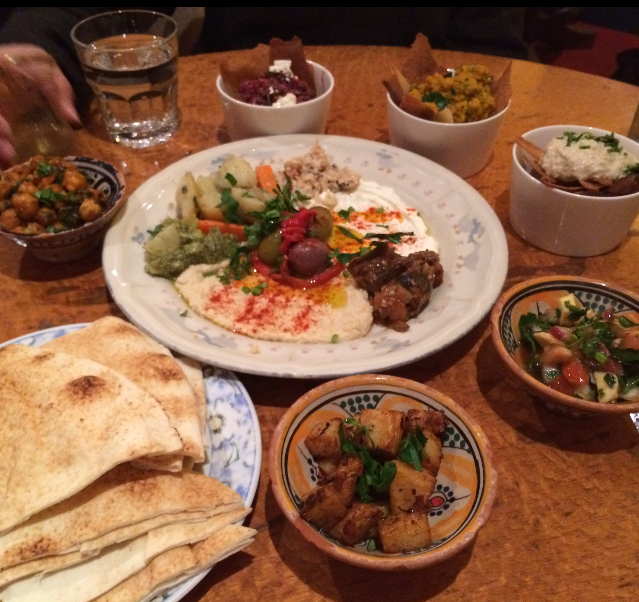 Moroccan Soup Bar – Starters (like a mezze platter). For mains, there were three dishes. The first one was Fetteh which is like a chickpea bake. It has chickpeas, toasted flat bread and slithered almonds in a creamy yoghurty mix which was rich and tasty. Yum yum yum. The second was 7 veg with couscous, that one is pretty self-explanatory. Moroccan Soup Bar – Mains (Creamy yoghurty mix with chickpeas, toasted flatbread, almonds). And the third plate had saffron rice, lentils, roasted eggplant and yoghurt. All the dishes were unique and had different flavours and textures, which made the menu really exciting. While each dish had individual flavours, everything worked deliciously well with each other. 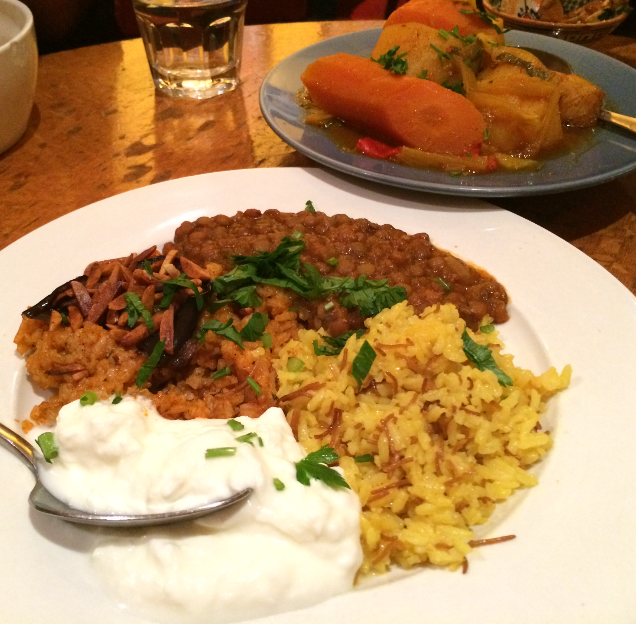 Moroccan Soup Bar – Mains (Saffron rice, lentils, eggplant, yoghurt & 7 veg with couscous). For dessert they served us a strong black coffee with a plate of desserts. 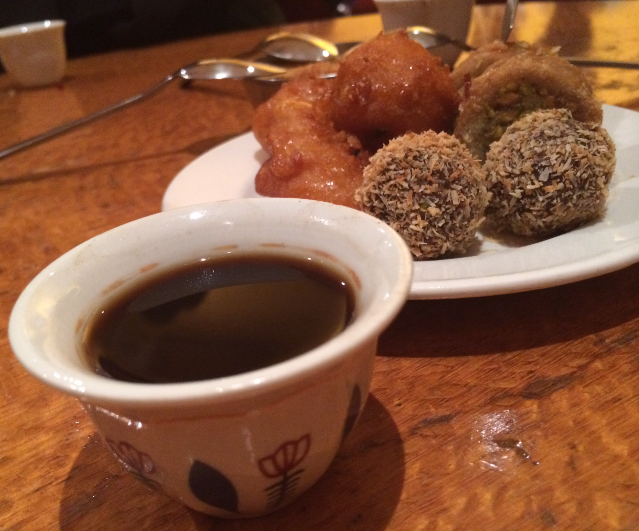 There were little fried doughnuts, spiced date balls coated in coconut and pistachio baklava. They also served custard with a hint of orange, which was delightful. If you eat the doughnuts with the custard it’s so yum. The star of the show was the baklava. It had a generous amount of nuts and it wasn’t drenched in syrup so it wasn’t too sweet. I’d say it was probably the best baklava I’ve ever had. The desserts were delicious and a perfect end to the meal. Moroccan Soup Bar – Coffee & Desserts (coffee, doughnuts, date balls, baklava). For takeaway meals they have this really cool system where they don’t have plastic containers so if you want to order takeaway, you have to bring in your own containers. They have some containers out front with an estimated price for the size of container. I love this idea because not only is it environmentally friendly, it also feels homely like you are taking left overs home from your mum’s house. They open at 6pm but you want to get there early to avoid disappointment. We got there just before 6 and there were a few groups of people already waiting in line. Everything I ate was full of flavour and it was great to taste a variety of dishes. Also it was a nice change to have the menu decided for you that showcases all of their delicious food. The characteristics of this place really create the sense that you are eating at a friends place for dinner. 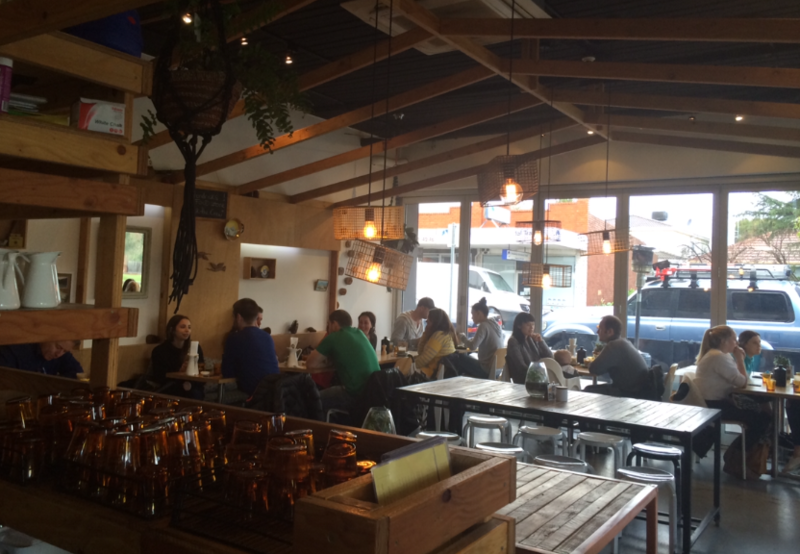 It’s a great little vegetarian restaurant with delicious and hearty home-cooked meals. I heart Moroccan Soup Bar! 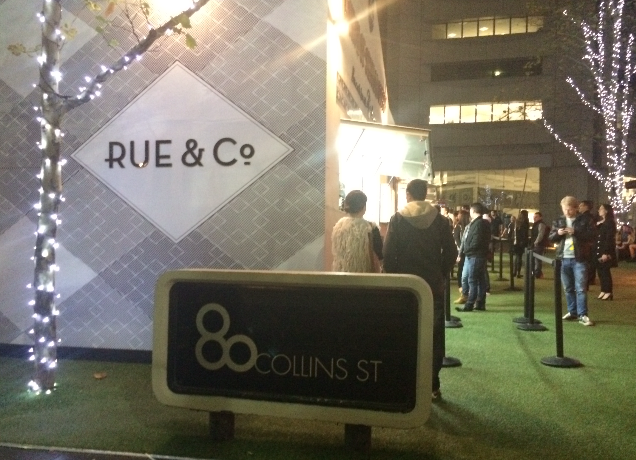 Rue & Co – Melbourne Pop-Up. We were wondering around for a place to eat for dinner and saw some astro-turf and bright lights, which captured our interest. 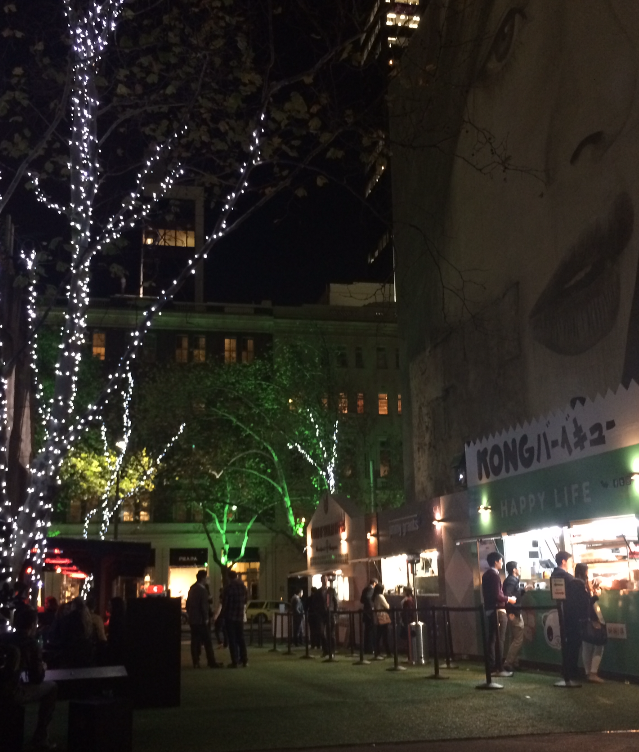 We walked over and had inadvertently stumbled upon a Melbourne pop-up on Collins street. Surprise! Awesome food. It was great, they had three shipping containers turned into food stalls and heated seating areas. Eating, seating and heating, exactly what I wanted on this cold winters night. Just when I thought it couldn’t get better, it got better. We were surrounded by some amazing artwork. There was a giant portrait of a woman on the wall and a digital installation projected on the other wall with a range of moving images. My fave part of the installation was the diamonds floating across the screen, they sort of moved like hot air balloons floating in the sky. 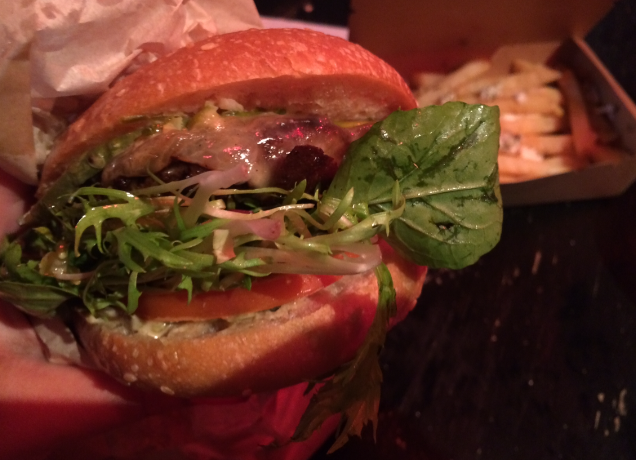 Rue & Co – Melbourne Pop-Up – St Ali beef burger. There were three stalls. 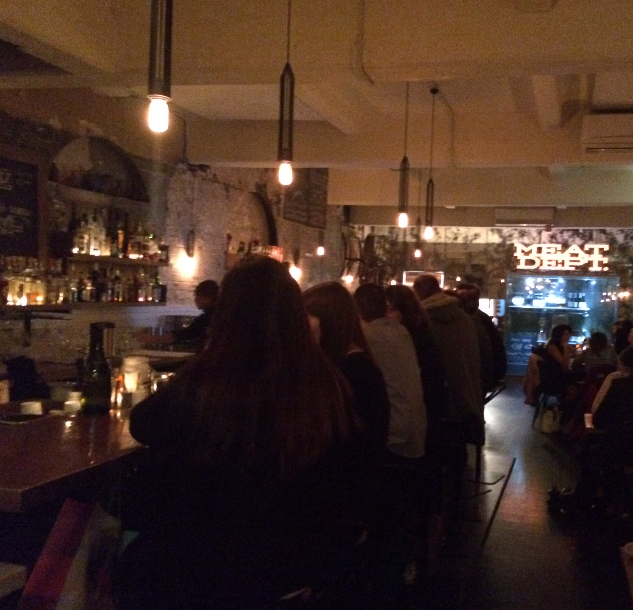 One was Salvatore Malatesta’s St Ali where you can get some amazing burgers. They serve yummy breakfast burgers in the morning and other delicious burgers during the day and night. 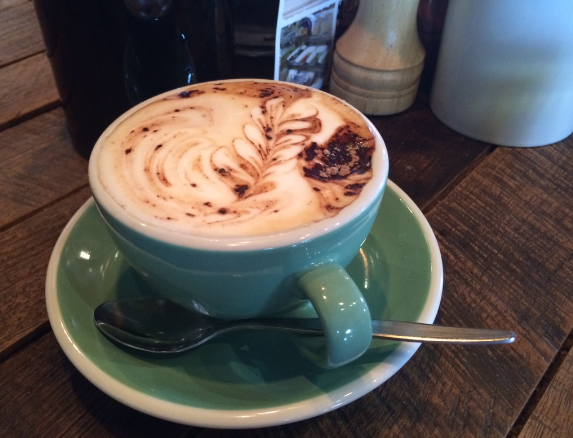 They also serve quality coffee and some cheeky desserts. Delicious giant cookies yum! I had the beef burger with melted cheese, lettuce, tomato, pickles and special sauce. It was classic and delicious. They had the mushroom trip burger with a pickled wild mushroom for the vegos, which sounded yum too. 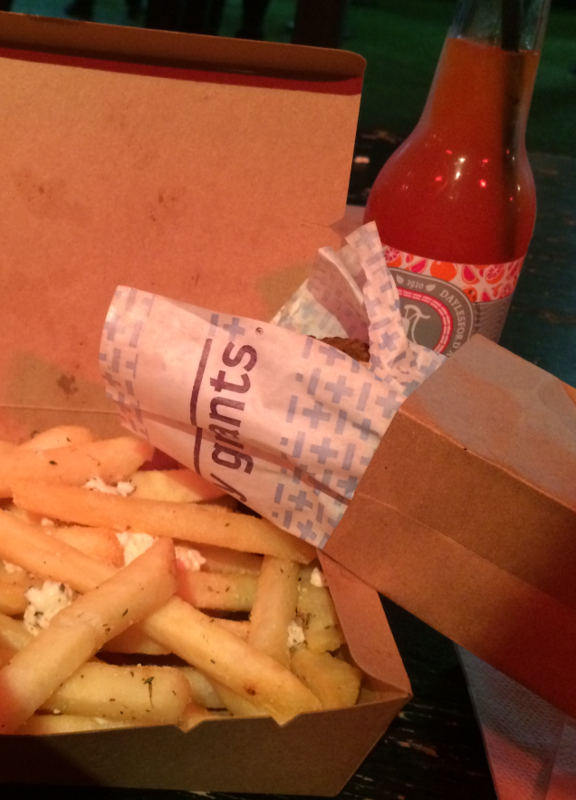 Rue & Co – Melbourne Pop-Up – Jimmy Grants souva and chips. The middle stall was George Calombaris’ Jimmy Grants. They had the Mr Papadopoulos (which is the lamb souva w chips mustard aioli, onions & parsley). The meat just falls apart, the bread is soft and fluffy and the chips are already in the souva. Love it. And the Homer, which is the veg option, has tasty falafels, greek yoghurt and helenic slaw. They also had some salads (the famous grain salad), jimmys dimmys (dim sims) and their chips with feta, garlic oil and oregano yum!! 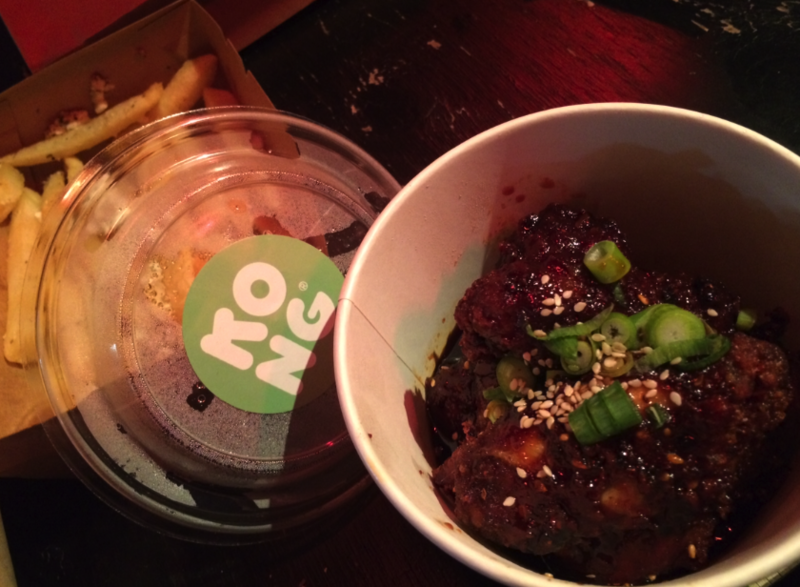 Rue & Co – Melbourne Pop-Up – Kong Korean honey & garlic chicken wings. The third stall was Chris Lucas’ Kong which had Korean chicken wings, steamed buns and some roti wraps. 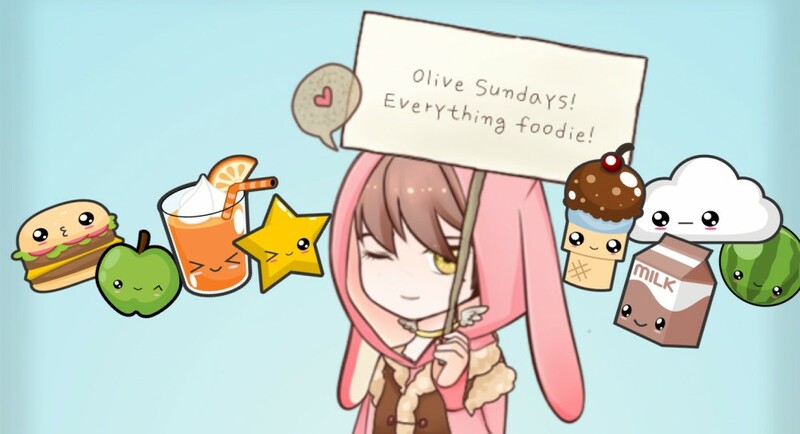 So many yummy things to choose from. I tried the chicken wings w honey, garlic and sesame seeds which was nice, they had spicy ones too. They had pork steamed buns and tofu ones that looked delicious. They were those open steamed buns, Gua Baos. They also had some roti wraps, which I want to go back and try. Pulled pork, slaw, kim chi, siracha mayo all rolled in a roti wrap. Sounds delish. It was mostly exciting because I didn’t know the pop-up was there. I must have missed the memo but I’m glad I did because just finding this place accidentally gave it all the more charm. We had some restaurant ideas in mind but hadn’t decided on where to eat. We naively wondered right into the adventure we were looking for. This pop-up came out of nowhere; I guess that’s what they do best. It was great! Sometimes when you are wondering through life, something unexpected throws all your ideas out the window and presents to you exactly what you are looking for. If something great comes your way, don’t be scared to change your plans. I heart Rue & Co! 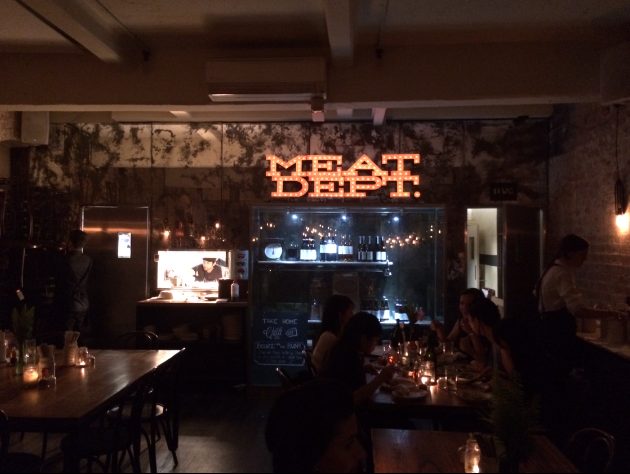 Meatball & Wine Bar – Melbourne. I’ve always seen the ‘meatballs’ sign on the window out front and was curious if they only sold meatballs. Yep, for most part of the menu there are different types of meatballs and wines. Hence the name. Sounds simple and it is, and that is what makes it remarkable. Meatball and Wine Bar use fresh Australian produce to create delicious meatballs and they are served in an uncomplicated way, which lets the produce shine. I like the idea that there are meatballs on the menu, but there are so many different choices on how you can eat the meatballs. It’s unique and it makes it fun. There is also a great wine selection. I love the décor! Brick walls, oaky furniture and wine bottles and wine boxes everywhere, it sort of felt like you were in a wine cellar. It was awesome! The atmosphere brings sophistication to the restaurant, which makes it much more than just some tasty meatballs. So firstly you can choose what type of ball you want. They have pork, beef, chicken, fish and veg. Then you choose a sauce. They had Italian tomato, white creamy or pesto salsa verde. And then you can choose something for the balls to sit on. Italian beans, creamy polenta, potato smash, homemade pasta or veg. You can also choose to have sliders instead, which are the balls and sauce of your choice in three mini brioche buns. Yum! 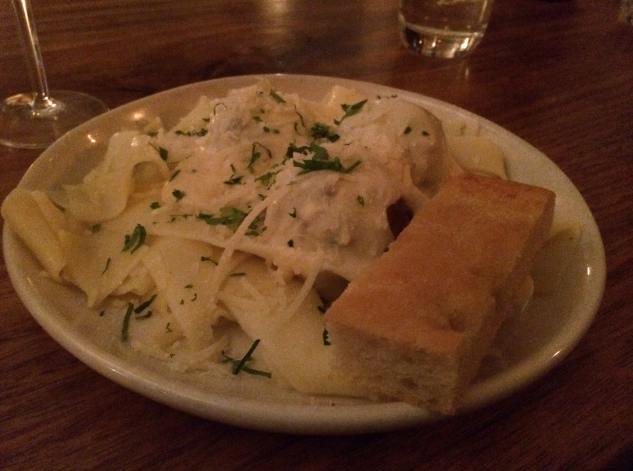 Meatball & Wine Bar – Pork meatballs with homemade pasta and white creamy sauce. The pork balls were my favourite type, which had fennel, sage and orange. We had them with the homemade pappardelle pasta, which was so thin and light and fresh, it was incredible. It went really well with the creamy sauce. Delicious! 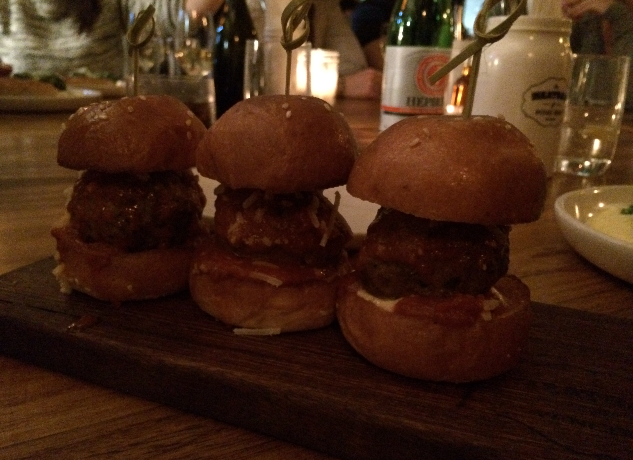 Meatball & Wine Bar – Beef meatball sliders with Italian tomato sauce. We also had the beef balls in the sliders with the Italian tomato sauce. The three little burgers were delicious. Oh if we got the pork balls in the sliders then it would have been the three little pigs. Oh well. Anyway these were delish! The brioche buns were soft and buttery and the beef was juicy and delicious. Plus there was a secret little pickle in each bun, which I liked. Wait, these were my favourite too. They were adorable and easy to eat. 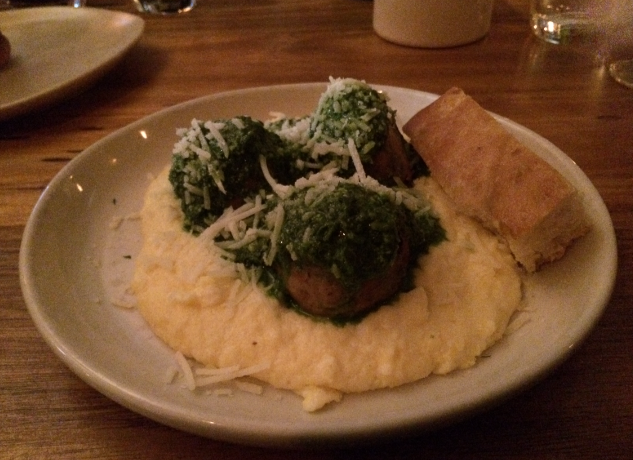 Meatball & Wine Bar – Chicken meatballs with creamy polenta and pesto salsa verde. We also got the chicken meatballs, which had pistachio, muscatels and parmesan. We had them with the pesto salsa verde on the creamy polenta. The polenta was really creamy as described in its title. That was yum. I liked the pistachio, the nuts made the balls more textural. Hmm I don’t know about that last sentence hehe. And the pesto was tasty. Meatball & Wine Bar – Whoopie Mac! Chocolate cookie and caramel ice-cream sandwich. For dessert we ordered a whoopee mac. The whoppie mac should be called ginormo! 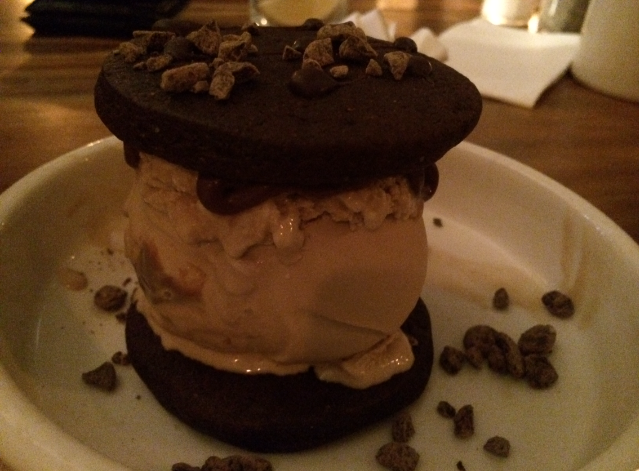 It was a ginormous ice-cream cookie sandwich. It was the size of a burger! It was massive and it was delicious. You get to choose your own flavour combo. They had a variety of cookies and a selection of homemade ice-creams. We chose chocolate cookie and caramel ice-cream, can’t go wrong. It was wonderful! It was massive, I don’t know if I could eat a whole one myself. The ice-cream was really smooth and creamy and the chocolate cookie wasn’t too sweet so it worked well. Plus also there were little surprise chocolate chips inside. It was yum. 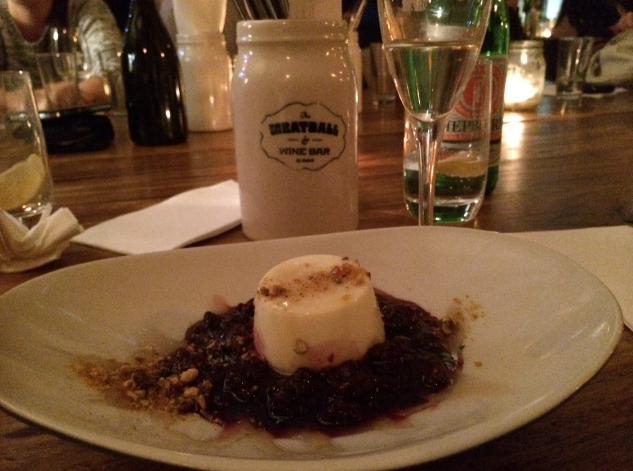 Meatball & Wine Bar – Vanilla bean panna cotta with berry coulis. We also ordered a vanilla bean panna cotta with berry coulis. This was a special on the night and it was good. The panna cotta was really creamy and vannilary which went well with the tart blueberry and blackberry coulis and biscuit crumb. It was really yummy. They also had charcuterie and cheeses which makes for a great appetizer or if you just wanted to drop by for a quick bite. I really enjoyed this place, it was fun and the food was great. I like that the meatballs were made from Aussie produce. The venue was great and so was the service. It was a great dinner, simple honest food and a fabulous wine selection. I heart Meatball and Wine Bar! 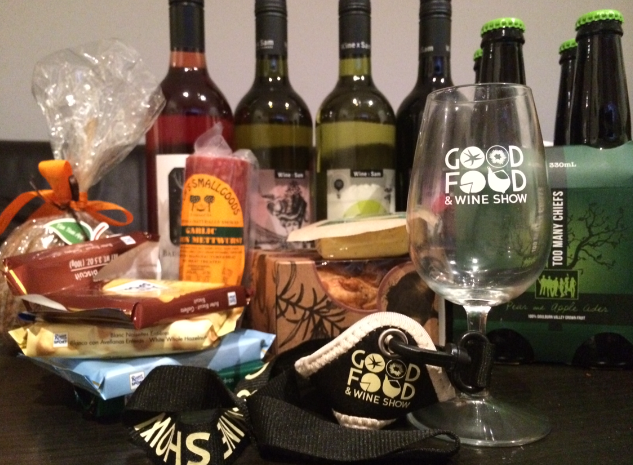 Good Food & Wine Show – Melbourne. 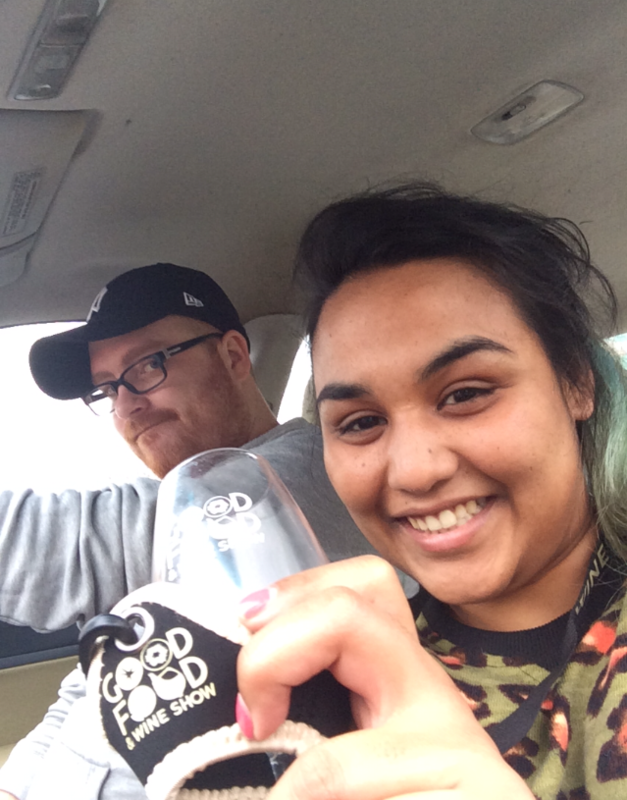 Today we went to the Good Food & Wine show at the Melbourne Convention & Exhibition Center. There were so many food stalls it was fantastic. Wine, cheeses, meats, chutneys, jams, macarons, chocolates and the list goes on. They had a variety of different products and they also had special events scheduled each day of the event. Lots of fun! 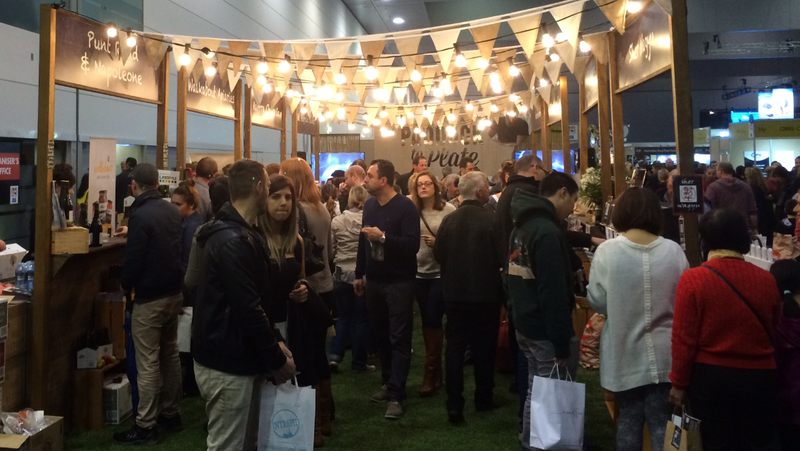 Good Food & Wine Show – Paddock to Plate. As we walked in we saw Matt Morans Paddock to Plate section where a collection of Australian products were featured including a range of wines, and fresh produce like olives, caviar, brussel sprouts (this stall had a really cute pic of a baby sitting in a bunch of brussel sprouts Anne Geddes style…so cute! ), cheese, and wagyu beef. We realised that most people were carrying wine glasses for the tastings so we went straight to the wine glass stand to purchase a glass. I noticed that some people had a lanyard which held their glass so they had two hands free to taste things. Genius! I bought the glass and the lanyard combo and went on my way. It was the best thing ever! Me and my little wine glass friend had a really great time tasting the millions of wines showcased (maybe not millions but there was a lot of different wines). And the best part was that when i wasn’t drinking, I didn’t have to hold my glass. Such a great idea. 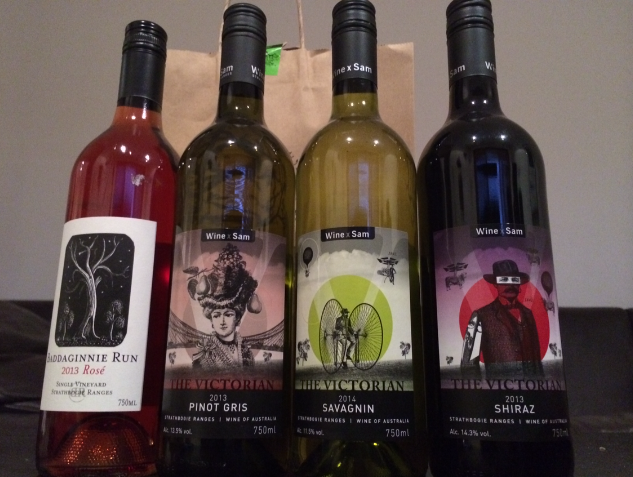 Good Food & Wine Show – Yummy wines! Baddaginnie Run and Wine & Sam. My favourite wines of the day were made by Wine & Sam. Their Pinot Gris, Savagnin (which was similar to a Sav Blanc) and Shiraz were delish and I loved the Baddaginnie Run Rose. Luckily we bought our bottles of wine at the end of the day because they were heavy to lug around. There were also some really tasty ciders going around. The ‘two many chiefs’ stall had a great pear/apple cider and ‘Lychee Gold’ had this lychee cider which was amazing! but sold out by the time we got around to it :( I also tried some chocolate and caramel vodka which was not bad. 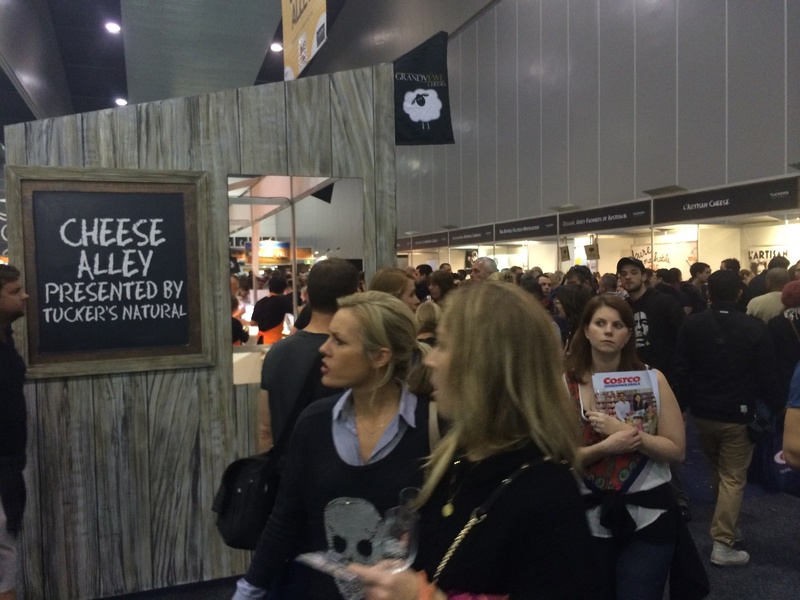 Good Food & Wine Show – Cheese Alley. Cheese alley was great. There were so many different cheeses to taste. Soft cheese, hard cheese, aged cheese, vintage cheese, marinated goats cheese, sheep milk cheese, buffalo mozzarella etcetera. So cheesy. 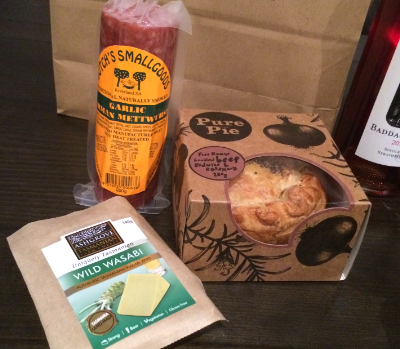 Good Food & Wine Show – Wasabi Cheese, Garlic Salami, Beef Pie. My favourite cheese was the Wild Wasabi from ‘Ashgrove Tasmanian Farm Cheese.’ It was unique and had the perfect amount of wasabi to have a kick but still taste creamy. It was so tasty and stood out from all the other cheeses I tried that day. Yum! yum! yum! After cheese alley we tastes some meats. ‘Butch’s small goods’ had a range of salami. I had to take home some of the Garlic German Mettwurst it was delicious . I also got a hot smoky grilled chorizo on a stick. Yum! 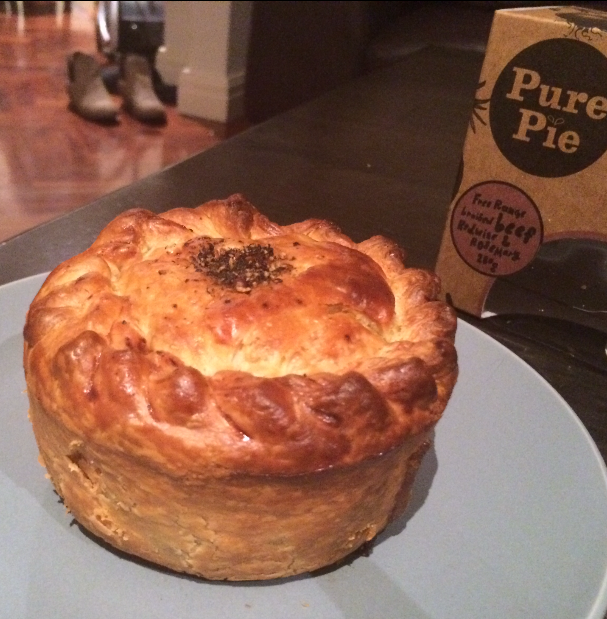 Good Food & Wine Show – Pure Pie – Free range braised beef, red wine & rosemary. I bought a ‘Pure Pie’ to take home. It was free range braised beef, red wine and rosemary. I ate it for dinner it tasted like a lamb roast inside a homemade buttery pastry. So yummy! And for dessert I had this Tim Tam apple which was a particularly large granny smith apple dipped in caramel and coated in crushed Tim Tams. Yum! Speaking of sweets, earlier in the day I also tried a waffle pop, which was a mini waffle on a stick, so cute. They had plain and cinnamon, then they had a variety of toppings like syrup, jam, chocolate and lemon curd. It was yum. 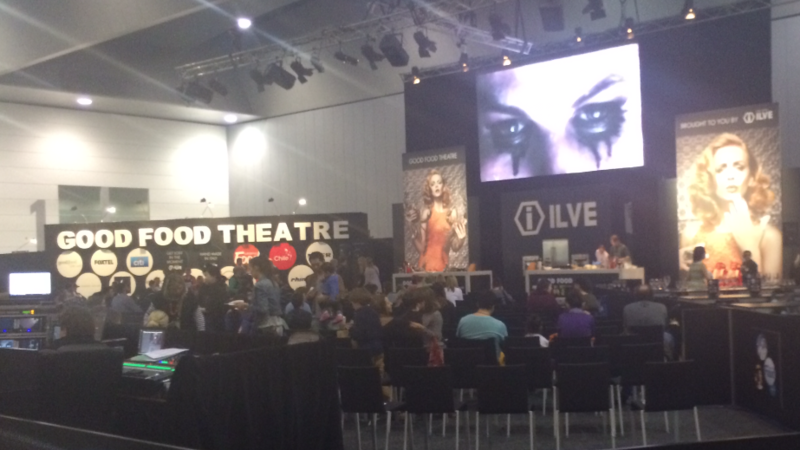 Good Food & Wine Show – Good Food Theatre. The Good Food Theatre had chef sessions with highly acclaimed chefs like Jacques Reymond, Adam D’Sylva, Matt Stone, just to name a few. 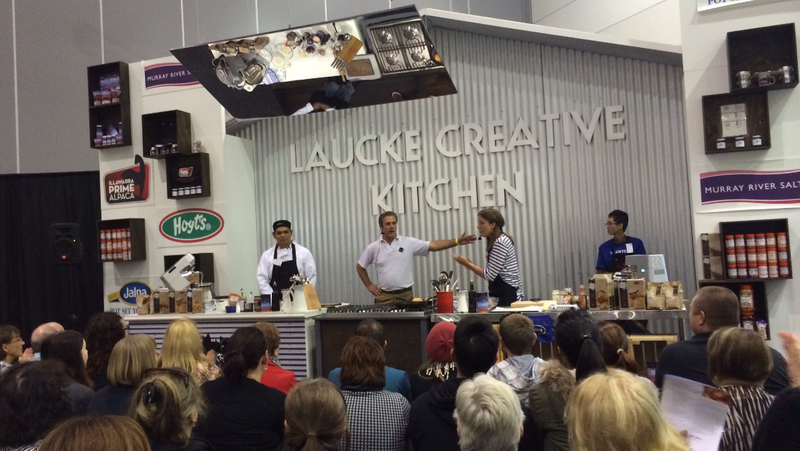 Good Food & Wine Show – Laucke Creative Kitchen. The Laucke Creative Kitchen had different cooking sessions throughout the day. 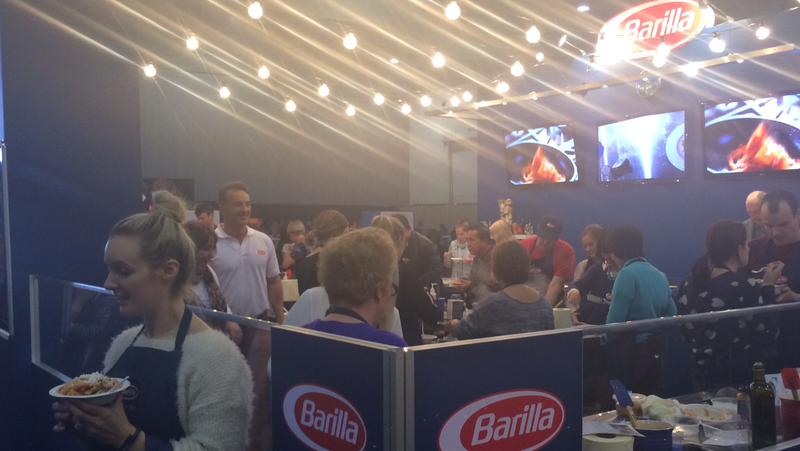 Good Food & Wine Show – Barilla Masterclass. There was Barilla master classes which was an interactive class where you learn to cook a delicious Italian pasta meal. 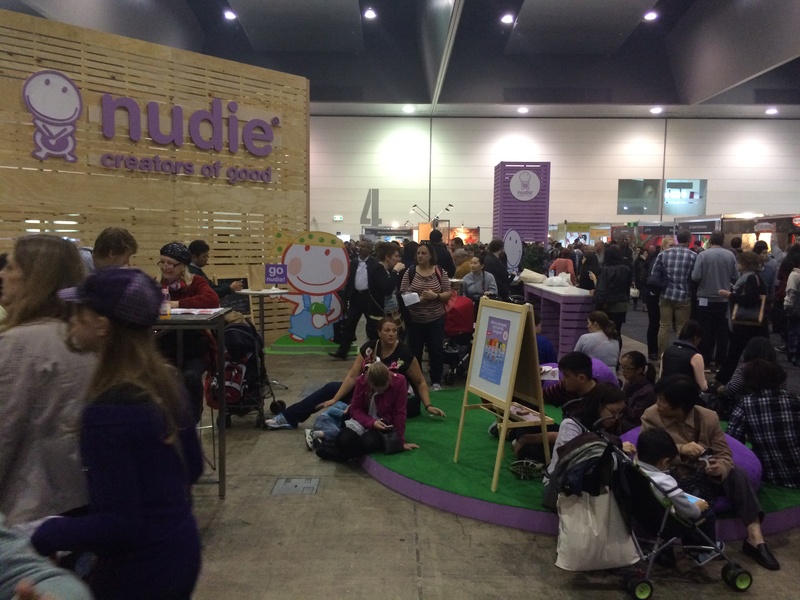 And there was a Nudie chill out area, if you wanted to rest for a bit (perhaps tasted a few to many wines). Good Food & Wine Show – On the way home…little bit tipsy. We had a really nice day, me, my bf and my little wine glass lanyard friend. I went home a little tipsy and took some delicious treats home for later. There was so much to do and see, we were there for about four hours. It was an enjoyable and entertaining day out. I had heaps of fun. I heart the Good Food & Wine Show!